Classical Baritone Opera Singer Sean Anderson - Alpha Artists Management, LLC. Classically trained for the Shakespearian stage, Sean Anderson has received high recognition for having a voice of “warm vocal velvet” by Opera News and is diversely adept onstage in opera, musical theater and classical drama. His repertoire list includes dozens of leading roles ranging from Verdi to Mozart to Gilbert & Sullivan and his magnetic stage presence and authoritative voice have won him critical acclaim for both comedy and tragedy. Recent and Upcoming: Mr. Anderson returned to Knoxville Opera in the 2016-17 season as The Pirate King in Pirates of Penzance; concerts with Intermountain Opera and returned as Carl-Magnus in A Little Night Music; and, he returned to OperaDelaware as Dandini in La Cenerentola. This season he was the title role in Guillaume Tell with both Baltimore Concert Opera and a staging with Opera Southwest; he was the title role in Gianni Schicchi / Buosco’s Ghost with OperaDelaware; joined performances at Lincoln Center with Philharmonia Orchestra of New York in La traviata; is the title role as Figaro in Il barbiere di Siviglia with Northern Lights Music Festival; returns to Knoxville Opera for Gianni Schicchi and The Impressario; sings Telramund in Lohengrin with Opera Southwest in the spring; and returns to The Princeton Festival next summer as the title role in Nixon In China. Next season he sing Sharpless with Knoxville Opera and Gellner in La Wally with Sarasota Opera. In the previous seasons he was Malatesta in Don Pasquale with Intermountain Opera; had his role debut as Eisenstein with Opera Naples in Die Fledermaus; returned to Sarasota Opera for his seventh season as Don Pizzaro in Fidelio; was Ford in Falstaff with Baltimore Concert Opera and OperaDelaware; and, sang Ned in Peter Grimes at The Princeton Festival. Among the roles active in his repertoire include; John Proctor (The Crucible), Iago (Otello), George (Of Mice and Men), Count Almaviva (Le nozze di Figaro), Don Pizarro (Fidelio), title role (Don Giovanni), Marcello and Schaunard (La bohème), Zurga (Les pêcheurs de perles), Belcore (L’elisir d’amore), Dandini (La Cenerentola), Guglielmo (Così fan tutte), Papageno (Die Zauberflöte), Silvio (Pagliacci), Mercutio (Roméo et Juliette), Eisenstein (Die Fledermaus), Captain Corcoran (H.M.S. Pinafore), Pirate King (The Pirates of Penzance), Enrico (Il campanello), and the Judge (Margaret Garner). 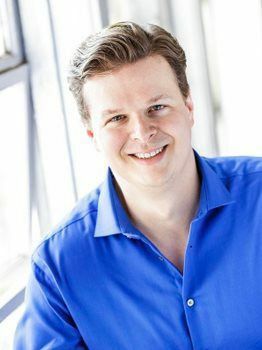 He has been engaged with such notable companies as the Santa Fe Opera, Chautauqua Opera, Sarasota Opera, Knoxville Opera, the former New York City Opera, New Jersey State Opera, Indianapolis Opera, Opera Columbus, Opera Southwest, Opera Theatre of Lucca, and the former touring arm of the San Francisco Opera, Western Opera Theater. A native of Akron OH, Mr. Anderson, he holds a B.M and M.M in performance of voice from University of Cincinnati – College Conservatory of Music. He has been honored by the Irma M. Cooper Competition, American Traditions Competition, McKay Award from Santa Fe Opera and the Adams Award for Outstanding Performance. He was a member of the esteemed young artist programs of San Francisco Opera Merola Program and Santa Fe Opera companies and was a cast member of Baz Luhrmann’s La Bohème on Broadway.